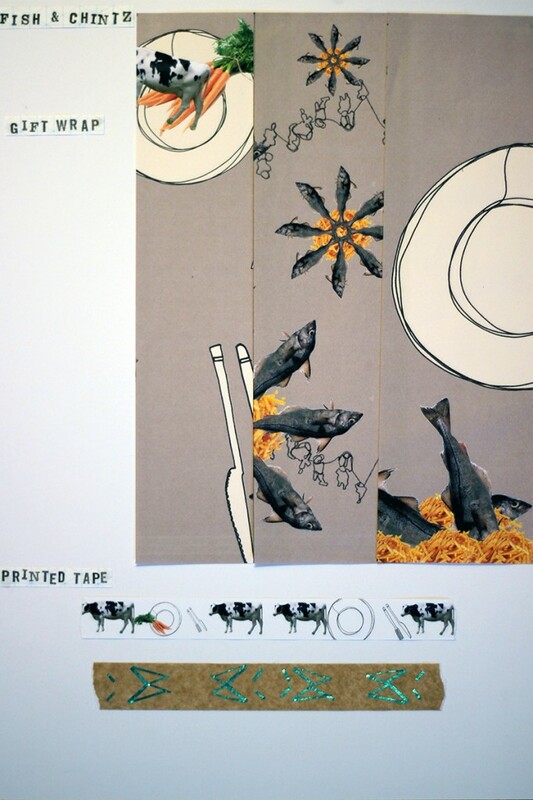 My final 3rd year project was “Fish & Chintz”, to fulfil a competition brief for Hallmark. This was a two week project whose theme was Monty Python’s Flying Circus, which allowed for all sorts of surreal techniques and imagery. Monty Python is a British institution; we all know about the Dead Parrot sketch and the Ministry of Silly Walks – they seem to simply be stored in the British subconscious. One description I read of the series said that it dealt with “the idiosyncrasies of British life”, which is a lovely phrase that I incorporated into the basis of my project. I began the project by listing as many typically British things as I could, like tea and biscuits, red post boxes, waiting in queues, etc. Flying Circus has a very strong element of surrealism, so I broadened my source imagery to include everyday items and made them surreal by drawing them in interesting ways. After reviewing and discussing the project, I reigned the sketchbook back in to look at the typical British items, focussing further on food; fish and chips, and the traditional Sunday roast. 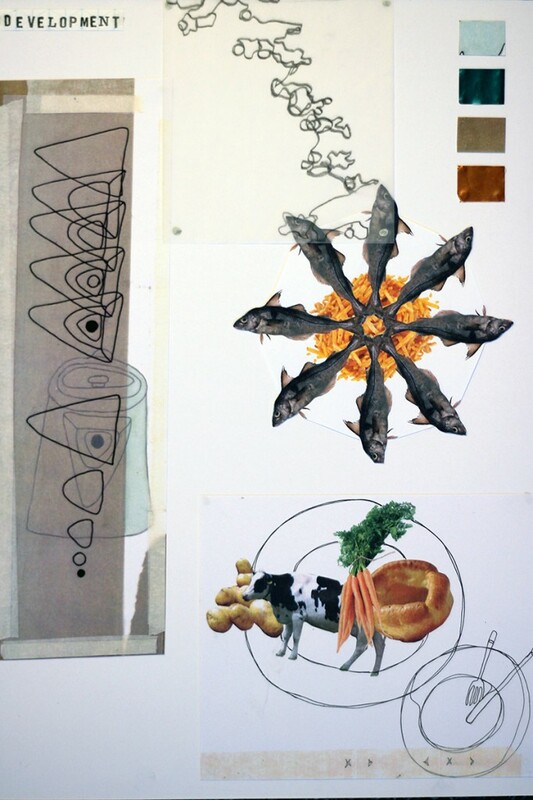 I kept the surreal element by reducing the dishes to their core elements: a cow, a fish, potatoes, carrots, etc. I incorporated my own drawing into photo collage designs to create gift wrap and printed tape designs for the young creative market and the people who buy for them; their friend group and older relatives who don’t necessarily want to give their mid-20s grandson a gift in schmaltzy wrapping paper. I feel that I have used a colour pallet and imagery that would be appropriate for wrapping gifts for males in this group. After presenting this project to Hallmark representatives, I was very fortunate to be offered a two week placement opportunity within the company’s ideation studio. Situated within Hallmark’s offices in Bradford in Yorkshire, I spent two weeks creating designs for wrapping paper, tags, and other paper products.